the walls and roof being covered with light V-jointed narrow oak slats. The fittings in the kitchen are gas cooking range with combined hot-closet, grill and water heater, Bunsen burner rings and hot plate, two wash-up sinks, folding table, cupboards and refrigerator box. The buter’s pantry contains two cabinet cupboards for dining service, cruets, cutlery, wind [wine? ], etc., sink and refrigerator, which serves as a table top, and also racks for glasses carried over the top of the side lights. The water for the kitchen and pantry is carried in tin-lined copper cylinders suspended from the roof and cased in light oak strips secured with brass bands. 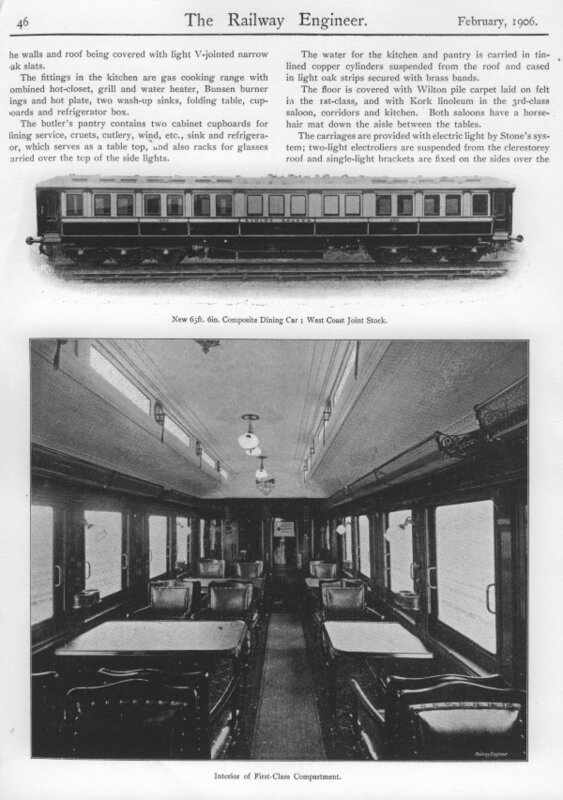 The floor is covered with Wilton pile carpet laid on felt in the 1st-class, and with Kork linoleum in the 3rd-class saloon, corridors and kitchen. Both saloons have a horsehair mat down the aisle between the tables.